Every once in a while I come across a new-dead-body-disposal-concept which I really like. Indeed, I really wish that I had tons of excess cash so that I could start my own dead body technology R&D company which would then develop innovative and exciting new ways to handle human corpses. We would be the Venture Capital worlds Death Angels. Or, if YOU happen to be a Venture Capital investor reading the Death Reference Desk (it could happen…) then drop me a line because I’ve got lots of great final disposition ideas! Until that happens, I’ll confine myself to ye olde Death Ref. Back in July, I came across this short Gizmag post on artist Jae Rhim Lee and her cultivation of flesh eating mushrooms. Actually she’s working with run-of-the-mill shiitake and oyster mushrooms and isn’t bioengineering some new kind of flesh eating fungus. Too bad, really. Anyway, Jae Rihm Lee’s project taps into the burgeoning world of green burial technologies, a topic which Meg, Kim, and I have covered in depth on the Death Reference Desk (I strongly suggest reading Kim’s excellent Green Burial: A Review post). 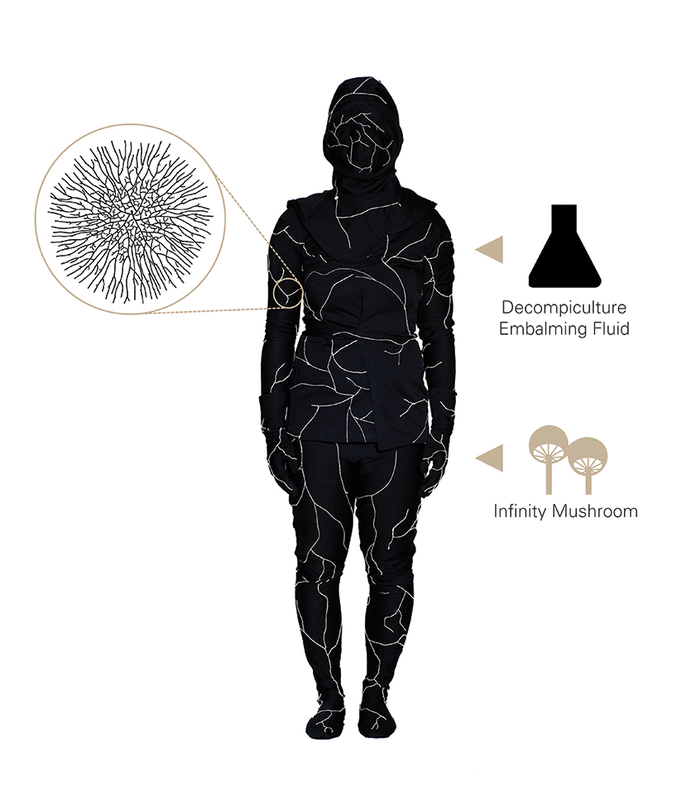 The Infinity Burial Suit prototype is made of organic cotton and covered with an embroidered net of thread which resembles the growth pattern of mushroom mycelium, and that has been infused with mushroom spores. A special cocktail of minerals and spores will also be introduced into the corpse itself, that will encourage mushroom growth from the inside. Special make-up based on the spore slurry is also being considered that will quickly break down and assist the decomposition process. The project is aiming towards the development of a natural burial system which will facilitate decomposition of the body, remediate accumulated body toxins, and deliver nutrients to plants in the surrounding area. Lee also hopes that the Infinity Burial Project will help raise awareness of the concept of death acceptance, rather than continuing to try and detach ourselves from our inevitable end. In a nutshell, what Jae Rhim Lee is proposing would work. I’m not sure that it is any more cost-effective than just leaving a dead body to decompose in a forest but that’s a tricky legal situation. Besides, if a dead body, um, dies in a forest and is then devoured by mushrooms and no one sees it, then what fun is that? Besides torturing an already over used metaphor. So I absolutely support the Infinity Burial Suit project, mostly because I can now embed the trailer for the BEST 1970s dystopian future film of all time: Soylent Green! Posted by John in Death + Biology, Death + Technology, Eco-Death and tagged decomposition, green burial. Bookmark the permalink.